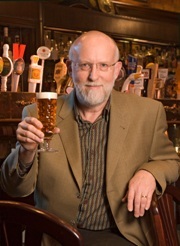 This week we feature an interview with Randy Mosher, author of the books “Brewer’s Companion”, “Tasting Beer”, and my personal favorite “Radical Brewing“. Randy is an accomplished long time brewer (27+ years) who was in on some of the early days of the homebrewing resurgence in the 1980’s and 1990’s. Randy is also an accomplished graphic artist who created most of the graphic art in his books. I would like to thank him for taking the time to do this interview! How did you get started in homebrewing? Like most people, got interested in the flavors of decent beer, although there wasn’t much of it around. I started to drink beer in 1970, pretty much the low point of good beer in this country, but when we did find some weird import we were all over it–if we had the money. By 1983, a friend named Ray Spangler and I finally stopped talking about it and ordered a kit, with we promptly made an ungodly awful concoction, which we drank anyway. Second batch was worse, but batch three was almost palatable. By batch eight, we had switched to all-grain and were poring over the ponderous professional brewing tomes we’d checked out of the library, and then, well, we never really looked back. Ray, BTW, won AHA Homebrewer of the Year in 1989, so eventually we made some pretty tasty brews. You are one of the best known brewing authors. How many books have you written and how did you get started writing? Three books as of right now. So, we’re brewing along, and I started to feel the need to keep track of things, so I cooked up a recipe sheet. Well, all those little spaces needed information–gravity, hop bitterness, etc–and so I made up some quick reference charts to aid with that. Then hop bitterness prediction, water treatment, and so on. Before long, I had a pile of stuff in my three-ring binder. Somehow Charlie Finkel of Merchant Du Vin got hold of me, and we hit it off, and he generously offered to publish the book through his homebrew business, Liberty Malt and Supply, in Seattle. About that time, I was graduating from an art director to a creative director in an ad agency, and that job works out much better if you have some writing chops, so I started doing some little projects that no one else wanted to do, which were savagely criticized by my boss, for which I will be forever grateful. Advertising writing, like it or not, is all about direct, economical communication, and I can’t imagine a better place to learn. This was 1986 or so, and I went out and bought a Macintosh computer: two floppy drives, a meg of RAM, a loathsome dot-matrix printer and I fumbled around with the weird graphics software that was available at the time (anybody remember Cricket Draw? ), and somehow, miraculously, was able to actually create a book document, The Brewers Companion. Later that year, booth Charlie Papazian and Michael Jackson published books with “Companion” in the title, so I guess great minds were thinking alike at the time. Radical brewing is a really unique brewing book with an eclectic style, and one of my favorites. Where did you find the inspiration for it? It was about a ten year brain dump. I’m a voracious (if not big spending) collector of old books and xeroxes of old books, and once you start to dig into this old material you realize how narrow the beer wold had become by the middle of the 20th century. So, plenty of material to work with when you add all the wacky homebrews I’d seen over the years, and also brewed myself. I sensed a need as well. There are so many creative people brewing, doing this great liquid art. but most of the books took a very analytical/engineering tack. Nothing wrong with that, but you have to use both sides of the brain to make really great beer. I think I hit a nerve, because I still get a lot of emails like “Thanks, I was getting bored with brewing, and Radical got me excited and gave me ideas about how to go off and explore. I noticed you are a graphics artist. Did you do the graphics work on your books? Graphic design has always been my main profession, and now I mostly do craft beer branding and packaging. I did everything on Companion except load it up with fresh typos right before it was sent to the press, which was the job of this madman that Charlie employed to run his computers. On Radical, I did everything, although of course, there was help with the editing and nitpicking. I was in the uncomfortable position of not being the designer of Tasting, but the publisher had liked the look of Radical and wanted it to have some of the same energy. The designer was a homebrewer and we conspired behind everybody else’s back, and in the end, got a book I’m proud of, although it looks different that if I had done it myself. I did do most of the work on the charts and graphs, shot nearly 50 photos and scanned a lot of old labels, engravings and other documents. As a visual person, I really try to use pictures to add information. It gets inside our heads in different ways that just using words. What advice would you give to experienced brewers looking to do something new? Shut up and do it. Don’t worry, it’s just a batch of beer. One of the most fun things is to invent a faux-historical situation and try to imagine what the beers might have been like. Pirate Ale? Albert Einstein’s homebrew? Beers made by the combined efforts of the Vikings in Newfoundland and the native people they encountered there? What would Captain Nemo have brewed on his submarine, the Nautilus? Or, just look at ingredients, take a trip to the spice shop, brew a beer with a grain you never used before. Make a beer your grandma will love. Download one of the rare old brewing books available for free on the internet, and decipher a recipe. Bored? Don’t tell me you can’t find ideas! Tasting Beer is another interesting book. What made you move from books on brewing to a book on beer styles? Just wanting to move to a larger audience. I’d been teaching a class for Siebel Institute called the “Professional Beer Styles and Tastings” class, and as I got this huge outline together, it just started looking like a book. Sam Calagione was kind enough to hook me up with his literary agent, and we’ve been conspiring ever since. It’s only 1/3 about beer styles. The rest of the book helps you understand what’s in the glass, how it got there, and how to get the most out of every little drop. It’s about becoming a connoisseur–or as we usually say, Beer Geek. How has homebrewing evolved since you started? The answer should be obvious if you just know that we started with basically nothing, and now, just look around. But now, even with all this wondrousness, it’s really about ingenuity, creativity, self-expression. Oh, and making a beer to drink that no one’s ever tasted before. Where do you see the hobby going in the future? Homebrewing already went somewhere. It’s called craft brewing. It’s my hope that the tremendous relationship of pro and amateur brewers, based on mutual respect and human-to-human fellowship will continue, no matter what else. My far-out dream? A licensed cooperative brewery, a kind of a big open clubhouse where people can sign up to use the equipment and then enjoy other brewers beers at the end of the day. Brewers Companion was focused on the beginner – any advice for homebrewers who have just started? Be brave, be bold, dream big, and pay attention to the details, because they matter like crazy. And remember, beer is one of the defining acts of civilization. Thank you for joining us on the BeerSmith Home Brewing Blog, and thanks again to Randy Mosher for agreeing to do this interview. Please don’t hesitate to subscribe or tweet this article if you enjoyed it, and have a great home brewing week. What an informative interview. I’ve been asking myself for some time why the American brewing scene has gotten so “radical”. Why do brewers in other countries perfect a delicious style (for example Belgian Dubbel, Munich Helles, Irish Stout, etc.) while we go bezirk with imperial green-raisin IPA’s (with no end in sight)? This gives me my answer: some people just get bored with delicious beer and they have to do something “weird” to stay entertained. Imagine what Captain Nemo would brew on his submarine? If that’s what you have to do, go ahead. Good beer is enough for me.